The Los Angeles Times‘ Richard Rayner has written an excellent review of the Parker novels—a noir crime series written by Donald Westlake under the pseudonym Richard Stark, that follows the exploits of master thief Parker as he cheats, steals, and murders his way through page after intoxicating page to get what he wants. From the review: Writing a couple of years ago in Bookforum, the Irish novelist and Man Booker Prize winner John Banville reckoned the Parker novels to be “among the most poised and polished fictions of their time and, in fact, of any time.” That’s high praise from an impeccable source, and Banville is right to single out the technical excellence of these books. The Parkers read with the speed of pulp while unfolding with almost Nabokovian wit and flair. Stark loves to shift character points of view, not only to advance the story but to go back inside the action and examine it for further angles and riches. The result is noir that drives forward relentlessly while feeling kaleidoscopic and reflective.… The first three novels—The Hunter (filmed as Point Blank with Lee Marvin and, later, less successfully, as Payback with Mel Gibson), The Man With the Getaway . . . In his August 28 article for the New York Times, “What I did this Summer,” William Grimes mentions his plans to “spend Labor Day with a sociopath.” Grimes writes: His name is Parker, and he lumbers through the pages of Richard Stark’s noir novels scattering dead bodies like peanut shells. Parker is a criminal. Cold-blooded and resolute, he experiences two or three emotions in the course of a novel and employs a vocabulary of about a hundred words. In a normal hard-boiled detective novel he would be the one left dead at the end. Instead he’s always the last man standing. And although Labor Day has come and gone don’t let that stop you from engaging in some post-summer R&R with Richard Stark’s Parker novels. Books currently available from the press include: The Hunter, The Man with the Getaway Face, and The Outfit with more on the way in future seasons. Read the rest of the NYT article here, or read an interview with the author. . . .
New in Paperback—The University of Chicago Press has embarked on a project to return the early volumes of Richard Stark’s Parker series to print for a new generation of readers to discover—and become addicted to. Stark’s ruthless antihero is one of the most unforgettable characters in hardboiled noir. Lauded by critics for his taut realism, unapologetic amorality, and razor-sharp prose-style—and adored by fans who turn each intoxicating page with increasing urgency—Richard Stark is a master of crime writing, his books as influential as any in the genre. Novels in the Parker series include: The Hunter The Man with the Getaway Face The Outfit Read the press release. Also read an interview with the author. . . .
Set in the fictitious town of Manawaka, Manitoba, Margaret Laurence’s The Stone Angel offers a moving portrait of its protagonist, nonagenarian Hagar Shiply, as she struggles to come to terms with the troubles of her past in a dramatic story of a life drawing to a close. 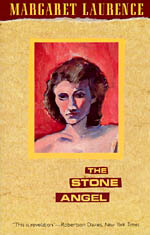 Alongside the other novels in her “Manawaka series”—A Jest of God, The Fire-Dwellers, A Bird in the House: Stories, and The Diviners—Laurence’s The Stone Angel has been lauded as one of her most poignant narratives and the most famous work by one of Canada’s most prominent feminist writers. The book was also recently made into a feature film by Canadian filmmaker Kari Skogland with its world premiere showing at the 2007 Toronto International Film Festival. This Friday, July 11 the film will also see its U.S. debut in select theaters, including NYC’s Landmark Century theaters, and hopefully will see a wider distribution (to Chicago maybe) in the following weeks. Check out a trailer for the film on the official The Stone Angel movie website, or find out more about the book here. . . .
Chicago magazine has a nice piece in the December issue about the inspiration behind Francis Ford Coppola’s new film—his first in ten years—Youth Without Youth. If you’ve been paying attention, of course, you already know some of the story. 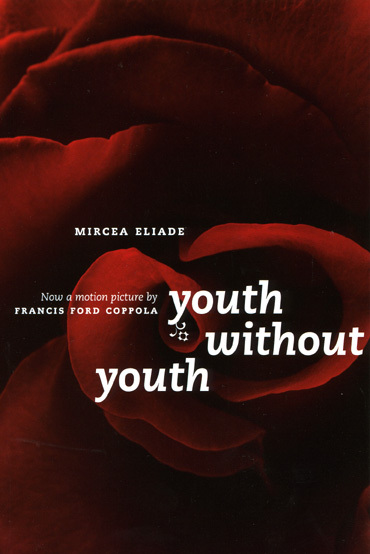 The literary inspiration for the film is the book of the same name by Mircea Eliade and the book was placed in Coppola’s hands by Wendy Doniger, a professor of religion here at U of C and a longtime friend of Coppola. The magazine article by Robert Loerzel tells more about the friendship: Doniger says she and Coppola were members of a “little coven of misfits and existentialists” at Great Neck High School on Long Island in the mid-1950s. “We were anti–Doris Day,” Doniger says. They wrote Hemingwayesque stories, listened to jazz in Greenwich Village, and smoked cigarettes. Doniger remembers Coppola as a “gawky” boy with a head full of ideas. But don’t read that “gawky boy” comment as too dismissive. Loerzel writes that “Coppola offers a little more detail: ‘She was, in fact, the first girl I ever kissed. '” We have an excerpt from the book. . . .
Book publishing is globalized; it has never been easier to obtain any book that has been published anywhere. As well, more and more English-language books are being translated in the non-English speaking world. The reverse is not so true, however. There is a trickle of foreign titles translated into the only language most of us in this country can read compared to the flood flowing in the opposite direction. So it is noteworthy that last Sunday’s Washington Post featured an article reviewing a sampling of some international voices currently hitting the U.S. mystery scene, including our translations of Swiss author Friedrich Dürrenmatt’s The Pledge and The Inspector Barlach Mysteries. Richard Lipez writes for the Post: Friedrich Dürrenmatt (1921-1990) was best known as the author of clever, morally inquisitive plays such as The Visit and The Physicists. In the early 1950s he also wrote three short, spellbinding mystery novels, which the University of Chicago Press has reissued in paperback with new translations from the German by Joel Agee: The Pledge and The Inspector Barlach Mysteries: The Judge and His Hangman & Suspicion. The latter includes a thoughtful foreword by Sven Birkerts, who praises Dürrenmatt’s talent as a captivating entertainer who could . . . The December 22 & 29 issue of the TLS is packed with reviews of our new volumes of the writings of Friedrich Dürrennmatt (see below). Each of the reviews—not to mention the books themselves—merits a separate blog post. Michael Butler’s review of Friedrich Dürrenmatt’s Selected Writings completes the TLS‘s coverage of our publications from this prodigious and engaging writer who is regrettably known only for several of his plays. Butler notes that since Dürrenmatt’s death in 1990, his work has suffered a “long silence at least outside of the industrious groves of academe.” Butler continues: The University of Chicago’s bold attempt with these meticulously presented volumes to “rediscover” Dürrenmatt for an English speaking readership is therefore welcome. The names of such distinguished scholars as Kenneth J. Northcott and Theodore Ziolkowski are a guarantee of high editorial standards, and each volume is equipped with a succinct and sensible introduction.… English readers have much to be grateful for. Above all, they have been provided with translations of impressive accuracy. Dürrenmatt is not an easy author to get into English, but Joel Agee has succeeded splendidly. He catches with admirable linguistic agility the shifts of tone and the unexpected shafts of humor amid . . . In the December 22 & 29 edition of the Times Literary Supplement Ian Brunskill’s review of Dürrenmatt’s The Inspector Barlach Mysteries: The Judge and His Hangman and Suspicion begins: The more well-ordered a world (or narrative) appears to be, the greater the potential for devastation …. that, to a large extent, is what drew Dürrenmatt in the 1950s to the traditionally disciplined realm of crime fiction, the conventions and formulas of which he proceeded, with some relish, to turn upside down. The resulting short novels have long been among his most popular works. Now wonderfully translated by Joel Agee, they are part of the University of Chicago Press’s promotion of the author. 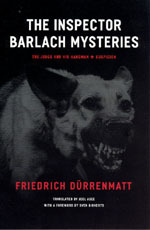 And indeed with these translations of The Inspector Barlach Mysteries the Press has done its best to reinvigorate interest in Dürrenmatt’s atypical crime stories. Both of the mysteries in this book make a radical departure from convention as they follow Inspector Barlach through worlds in which the distinction between crime and justice seems to have vanished. In The Judge and His Hangman, Barlach forgoes the arrest of a murderer in order to manipulate him into killing another, more elusive criminal. And in Suspicion, Barlach pursues a former . . .
Last week Alberto Manguel—whose own work as a translator and editor makes him quite a qualified critic—wrote a review for the Spectator of Friedrich Dürrenmatt: Selected Writings. 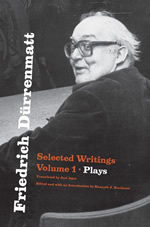 Translated by Joel Agee, the Selected Writings collects in three volumes the best of Dürrenmatt’s plays, fictions, and essays—and as Manguel acknowledges—captures the essence of the author’s work. Manguel writes: I’d like to congratulate the University of Chicago Press for allowing us once again to read Friedrich Dürrenmatt in English, thereby restoring to the English-speaking public one of the most important writers of the 20th century … Dürrenmatt’s best writing has been included, and almost any of these pieces is an astonishing example of a writer’s power to portray and explain experience, and then subvert the whole procedure by opening up his arguments to unanswerable questions. Reading Dürrenmatt’s work leaves us with the impression of having witnessed the creation and then the explosion of a small galaxy. The light continues to reach us long after closing his books. We created a Friedrich Dürrenmatt website where you can peruse a fascinating collection of excerpts and essays, including an interview with Dürrenmatt . . . .